Asbestos or asbestos containing material in the workplace can be very dangerous to the wellbeing of your staff. When asbestos is disturbed, dangerous fibres are released into the air which can cause serious diseases such as mesothelioma, asbestos-related lung cancer and asbestosis to name a few. If you discover asbestos in your work premises, it is imperative that you deal with it as soon as possible. If you’re unsure of the correct practices for dealing with asbestos, Envirocraft are here to help. Who is responsible for managing asbestos in the workplace? The responsibility to manage asbestos in a non-domestic property belongs to the person or organisation who is in charge of the maintenance or repairs of the property, usually the leaseholder or owner of the property. In a multi-occupied building, the leaseholders are usually accountable for the parts they occupy while the owner will be responsible for communal or common parts of the building. If you are a leaseholder, check your lease contract for the relevant information – if it is not specified that you are responsible for maintaining your rented areas, the duty should fall to the property owner. As the duty holder, what steps do I need to take to manage the asbestos in my premises? As the dutyholder, it is your responsibility to investigate the safety of your staff and take steps to minimise the risk of exposure. Steps you should take include locating the asbestos (if in doubt, assume there is asbestos), assessing the risk, making a plan to manage the risk and contacting the relevant people (building contractors, for example) to let them know, minimising the chance of the asbestos being disturbed. Does the asbestos have to be removed? No, the asbestos doesn’t have to be removed as long as it is safely contained and will not be disturbed. In fact, removing asbestos unnecessarily can be more dangerous than leaving it in place. Once you have found asbestos, call out a specialist who will be able to advise you on the best course of action. Who can remove asbestos from my workplace? 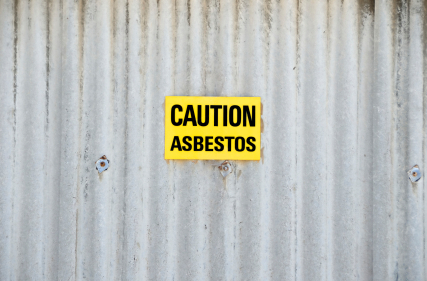 For low risk asbestos that is in a more secure form – for example, in an asbestos cement sheet or roofing – any competent contractor can carry out the removal. If your asbestos is high risk, the removal must be carried out by a licenced contractor. What is high-risk work with asbestos? Any situation where the worker is more exposed to disturbed asbestos is considered to be high risk, which is why they need to be licenced to carry out the work in the safest possible way. Are there any buildings more at risk? Yes, as asbestos was predominately used between the 1950s and the 1980s before it slowly began to be phased out and then eventually banned, if your building was constructed or refurbished prior to the year 2000, it is at a much higher risk of containing asbestos. There’s asbestos containing materials in my building – how do I know if they are in good condition? Checking the nearby area for dust or debris that could have come from the material. If you identify any of these signs, contact a specialist. A wetting agent is applied to the asbestos to reduce the risk of fibres being released and the area is protected with plastic sheeting. In some cases, a Negative Pressure Unit is used to ensure that all particles are sucked out of the air during the removal. The asbestos is carefully broken up and put into sealed plastic bags and protective coverings before being removed from the property. The area is then carefully cleaned up with a damp cloth to collect any fibres that may have slipped through the protective sheetings. Specialised protective wear is worn during this entire process to prevent inhalation. What happens to asbestos after it is removed? Because asbestos does not biodegrade and can last for hundreds of years, it must be disposed of very carefully. It is not permitted to end up in a standard landfill and is instead disposed of in a special hazardous waste landfill authorised to accept asbestos. For safe and reliable asbestos disposal, look no further than Envirocraft. 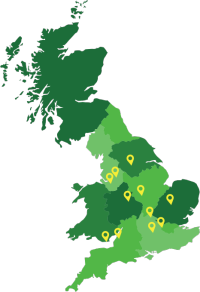 We operate throughout the entirety of the UK, with multiple hubs located across the country and a flexible fleet of vehicles to travel to any location quickly. We cater to both domestic and commercial clientele alike and are fully accredited to dispose of asbestos in a safe, professional manner. For more information on this, or any of our other waste disposal services, get in contact with our friendly team of advisors today and we’ll be happy to help.